Today, Sunday 7 December 2014 is Pearl Harbor Day—a time to remember those who died exactly seventy-three years ago and to remember the dramatic event that triggered the entry of the United States into World War II. “A date which will live in infamy,” Roosevelt called it in his speech to Congress. 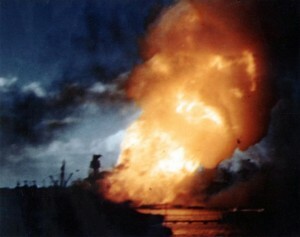 None of the US carriers were at Pearl on that fateful Sunday, but the loss to the USA of its Pacific-based battleships was a bitter blow. The road to victory would be long and hard fought. This entry was posted in Vignette and tagged Pearl Harbor, Pearl Harbor Day, Roosevelt. Bookmark the permalink.